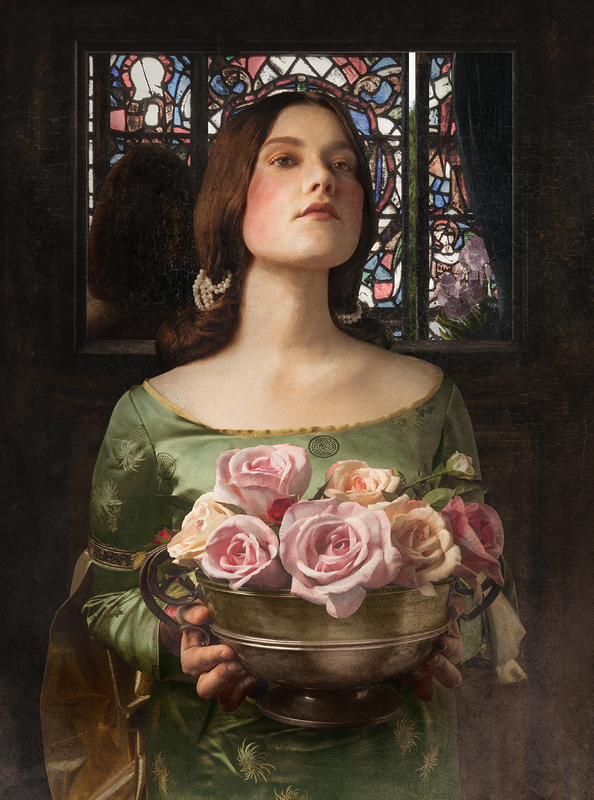 Gather Ye Roses is comprised of various elements photographed by Alex Buckingham, shot on location and in the studio in a hommage to the preraphaelite painter John Waterhouse. The retouch included manipulating elements to fit into perspective, tonal and colour adjustments to match the original painting and a painterly brush technique applied to each element to give the impression of a painting. Applying the same techniques as Waterhouse, various brush (electronic) styles were used to represent different materials (ie a fine hair brush style for walls and hard surfaces, and a palette knife technique for cloth and skin). Use of stippling type technique was also used to show added detail while still remaining vague as to not attract the eye. Crossing over colours from surrounding elements was used similar to the painter to bind the elements to the same plane. The Waterhouse series was published online for self promotion and distribution.